A friend I work with is helping me with last minute things as I get ready to move to the new Early Learning Center in our district. I wanted to say thank you, but with something that just screamed "her". 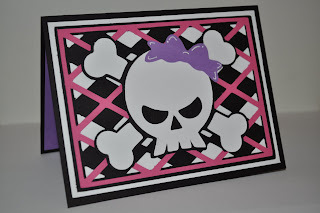 I absolutely loved this background cut on the Wild Card cart and couldn't figure out exactly what to add to it, but I knew I wanted to use a skull somewhere in the design (which she loves). I wound up finding the same design I had in mind on the cricutcritters blog. I went ahead and added the bow Tammy had used, because it added a girly touch. My friend will love it! This is so cute! I love it!! I may just have to scraplift this idea! OMG THis card it great. This would be perfect for my 15yo DD! I love to colors. What a great card. SUPER cute! I will have to try this one out! THanks for sharing!